A nonpossessory right to use another's property.Easements may be created by express words of grant in a written document, by prescription (unrestricted usage over time resulting in property rights),or by necessity,as when the law will force the grant of ingress and egress rights for landlocked property. • Easements are said to be appurtenant or in gross. 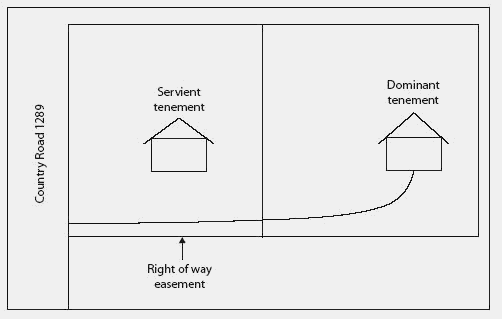 If appurtenant, then the easement bene fits one property and burdens another one. The property being benefited is called the dominant estate, dominant tenement, or dominant hereditament—they all mean much the same thing. The one with the burden is called the servient estate, tenement, or hereditament. • Easements appurtenant stay with the land, no matter who owns it or how many times the land changes hands. An example is a right-of-way easement. • If the easement is in gross, then it is personal to someone and does not benefit a particular property. A common example is a power line easement. The easement stays in effect no matter who owns the land burdened by the easement, but typically expires with the death of the owner of the easement. • An easement may not unduly burden the property. Example: A right-of-way easement may have been originally granted so one farmer could cross the property of another to reach another field. Later, one farm is sold to someone who plans to build a 250-home subdivision and use the right-of-way as the construction entrance. Courts will not allow this. Q: What are the requirements that must be complied with before one can be granted of easement of rights? Mount Aldie appealed, arguing that the circuit court had erred in its construction of the easement. Therefore, the court ruled Mount Aldie's admissions that it disturbed more than 1,000 square feet of earth within the buffer without giving prior notice or receiving permission did not prove LTV's claim that Mount Aldie breached the easement. what rights are afforded the County for the easements along with their locations. An appraiser can provide strategic advice to public agencies, explaining that using broad easement language offers the agency flexibility in constructing and operating its project, but it also will increase compensation amounts and can result in significant severance damages. 3d 112, the acquiring agency sought to acquire an avigation easement over a property adjacent to an airport. In a typical case, a landowner grants an easement over real property to a charitable donee (generally a land trust) and is thereafter subject to restrictions on the use and development of the property. In recent years, however, the IRS has increased its scrutiny of conservation easements, generally focusing on whether the easement furthers specific conservation purposes, whether the easement would in fact be enforced in perpetuity, and whether the parties have overvalued the easement.